Much of our trip to Kenya and Tanzania took place in areas populated primarily by the Maasai tribe, and we had lots of opportunities to observe and learn about their fascinating culture. Our very first glimpse at Maasai life occurred as we were flying from Nairobi into the Maasai Mara Game Preserve on the first full day of our African adventure. As we approached Maasai Mara, we could clearly see the distinctive round villages, or bomas, of the Maasai on the plains below our plane. 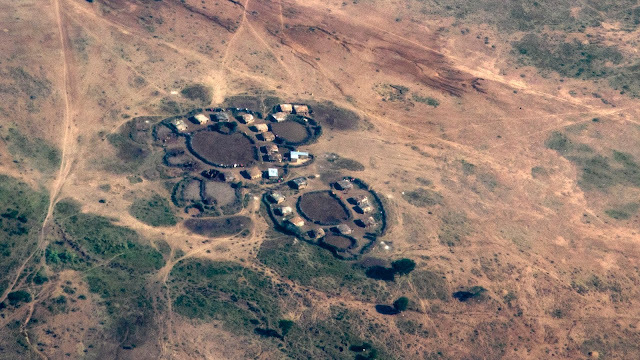 Maasai boma seen from the air. Photo courtesy of Al Crawford. When we landed, we were greeted by our guides, two young men from the Maasai tribe, Solomon and Javin. Solomon, Javin, and George greet our tour members. On the first evening in Sentrim Mara, our lodge for the next three nights, we were surprised at dinner by a group of Maasai men singing and dancing the aduma, their characteristic "jumping" dance. The origins of this dance became clear when we saw the tall grass on the plains of Maasai Mara and the Serengeti. It would be one of the few ways to keep an eye out for predators threatening the cattle herds on the grass-covered plains. Maasai dancers in the Sentrim Mara Lodge dining hall. There was also a Maasai boma right outside Sentrim Mara. Each time we left the lodge and returned at night, we could see the villagers going about their daily chores. Cattle returning to the boma in the evening. During our tour, we had three special opportunities to learn about the Maasai. On our last day in Maasai Mara, Solomon presented a very informative lecture. Later, in Tanzania, our guide Cosmas shared more information as we drove through Maasai land on our way to Tarangire National Park. Best of all, a Maasai family welcomed us into their boma where we spent a great morning participating in the life of the villagers. There are 42 ethnic groups in Kenya, but they are grouped according to their similarities into three main classifications: Bantu tribes make up about 70% of Kenya's population. The Cushites are nomadic tribes with close ties to Ethiopia and Somalia. Finally, the Nilotes (named for the Nile River), are classified into three distinct groups: the River Lake Nilotes (whose tribes include the Luo tribe of Barack Obama's father), the Highland Nilotes, and the Plains Nilotes, which includes the Maasai tribe. In Tanzania, there are more than 130 tribes, also grouped into larger groups: the Bantu (80% of the tribes), the Bushmen (a small group of only 5 tribes), and the Maasai. Each of the tribes has their own language or dialect, but Swahili is the common language in both Kenya and Tanzania. The Maasai people live in both Kenya and Tanzania. So far, they have been very effective at maintaining their traditional way of life, although we learned that there is concern that this is being threatened by the modern world. Extended families or single families live in bomas - villages usually laid out in a circle consisting of several round huts made of wood and plastered with a mixture of mud, grass, and cow dung. These villages are quite small - with the size being determined by the size of the family. The Maasai are polygamous, so a village often consists of one hut for each of the several wives and their children. The bomas are often surrounded by "fences" of thorny acacia branches woven together in thick tangles to keep predators out. Their primary livelihood - and their wealth - remains the herding of cattle, sheep, and goats, These herds are kept safe at night inside fenced areas in the center of the boma. Some families are reluctant to send their children to school for a couple of reasons. First, the children serve as the shepherds. We observed herds being guarded by very young children of only 7 or 8 years old! Village children watch over the herds and flocks. An animal enclosure in the center of the boma. Both Solomon and Cosmas, our Maasai guide in Tanzania, mentioned that the children who were "less intelligent" (i.e., less skilled as herders) were the ones sent off to school as their "punishment." Cosmas joked that he was one of those children, but I could not help but notice that his education had put him in a position to get a good job as a tour guide. And our guide, Javin, had a university degree and plans to attend the University of Michigan to get an advanced degree in wildlife management! Many families also worry that school will "modernize" their children. In fact, some families encourage their educated children not to return home to the boma, as it will corrupt their traditional culture. These educated children do face some discrimination, although Solomon explained that it's getting better, and more and more children are now being send to school. The Maasai diet is also strongly influenced by their traditional profession of herding. Their primary food is beef, mutton, or goat meat, and milk - sometimes mixed with cows' blood for a protein-rich drink. The Maasai rarely eat fish - or swim - because the crocodiles are a danger to the cattle, making the river an evil place. It was quickly evident to us tourists that the Maasai also continue to dress in their traditional clothing - especially the brightly colored shuka, a large bolt of cloth wrapped around the body in a variety of ways. Solomon explained that these robes were originally capes of cowhide smeared with red mud. The favored red color served several purposes. It made it easy to identify Maasai warriors in battle. It helped frighten predators, and it signified the cows' blood that still makes up part of the Maasai diet. In the 1960s, the people traded the cowhide robes for woven cloth, but kept their love of the bright red color - although we also saw many Maasai villagers in cloaks of deep blue. Women wear brightly colored sarongs, or lesos, with a variety of designs. Different beads and necklaces help to identify different Maasai groups, and a lady's marriage status is indicated by her style of ear and body jewelry. Solomon and his friends share the history of the colorful Maasai clothing. The second rite of passage is body marking with tattoos or other marks, which takes place before the age of 10. These mark someone as a member of the Maasai tribe, but some families are opting not to continue this tradition because they want their children to be able to blend into modern society more easily. The third rite is circumcision at age 11 or 12. Traditionally, this was done on both boys and girls. (On girls, we would know this as genital mutilation, and I was relieved to learn that this practice has been banned by the Kenyan government. Through public education and better understanding of the negative aspects, the practice is disappearing.) The rite of circumcision marks a boy's transition from childhood into warrior status. As they heal, they wear black robes and facial make-up that mark them as new adults. We saw several groups of these children as we traveled through the countryside. The young man in the black feathered cap was recently circumcised. This group of boys outside of Ngorongoro Crater had just entered adulthood. The young warriors are presented with a shield, a clout, and a machete. Their traditional duties for the next ten years included protecting the village, cattle raiding against other tribes, and lion hunting. (The Maasai believed that all the cattle in the world belong to them, given into their hands by the creator, thus they were justified in taking it from the surrounding tribes.) The protection of the village and the herding of cattle continue, but cattle raiding and lion hunting are illegal in the modern world. Solomon explained that cattle raiding has been replaced by shrewd trading. The warriors have learned to bargain for the best prices for their cattle in the marketplace. Lion hunting has been replaced by the financial benefits of eco-tourism and the Maasai are learning to protect their homes without resorting to killing the lions that are a danger to their herds. The girls' transition into adulthood also comes early. They usually marry very young, at around the age of 14 to 16 - although this may be delayed if a girl continues with her education, which is becoming more common. Women are encouraged to have as many children as possible. Children are seen as a great blessing. The fourth rite of passage is marked by end of a boy's service as a warrior in his mid-twenties. At this time, he marries his first wife. Solomon explained that the first marriage is usually arranged by the parents, but the men are later able to select their additional wives themselves, as they have learned from the first wife the qualities they are looking for. Cosmas also mentioned that often the first wife selects the second wife - and her primary goal is to choose a strong woman who can help with all the chores! The final rite of passage is death. The traditional Maasai burial consisted of covering the body with cow blood or fat and leaving it in the bush to be devoured by predators. Today, most Maasai have adopted Christianity and traditional Christian burials are more common. One of the most memorable and enjoyable experiences of our trip was a morning with a Maasai family in their boma outside of Tarangire National Park. With Cosmas translating, Chief Lobulu welcomed us into his village and the villagers greeted us with song. Then his three wives and other extended family members took us each by the hand and draped us in shukas, lesos, and beaded jewelry. The women of the village drape us in their traditional clothing. Lani enjoys her new look. Some of our tour members in their finery. and we all enjoyed their enthusiasm. There were lots of smiles and laughs throughout the morning. My "partner" for the day was Lobulu's second wife, Anna. Anna and me (with guide Cosmas in the background). Anna was a very confident and charming woman who took me under her wing, patiently showing me through gestures and smiles how to participate in the various activities. We learned traditional crafts - weaving strands of bark and making beaded bracelets. We participated in the work of the village, learning to balance long sticks of wood or buckets of water on our heads. We were invited to help re-plaster one of the houses with a mixture of clay and dung, and some of us went up on top of the hut to help re-thatch the roof. Charlotte and Laura weave strips of bark. Our group learns to make beaded jewelry. Bob and Rob pound the maize. Samantha and I balance long wooden poles on our heads. while others re-plaster the mud walls. Laura and Mary show off their muddy hands after helping with the plastering. Pounding the maize was one of the childrens' chores. This activity went on throughout our entire visit. The kids keep an eye on us visitors. In addition to the chores, there was plenty of time for social activity and fun! The men of our tour group joined the men of the village to learn the jumping dance, while we women sang and danced in a circle. The women join in the dancing. And we end with the entire village dancing together. After the activities, we entered the home of Lobulu's first wife, where he told us more about village life. Each of the wives has her own house and does her own cooking for herself and her children. The chief rotates from one house to the next each night so that no one is favored. What a fascinating discussion! We asked questions of the chief and his wives, and they asked questions of us. Lobulu was an enlightened chief who supported education and the government's ban on female circumcision. His village midwife had attended a government presentation on the negative aspects of this practice, and she was able to educate the people of the village. As we questioned each other, I noticed that, while we westerners might find some aspects of the Maasai society to be unusual, the women clearly thought the same of some of our practices. One of the wives asked each of us how many children we had. One of our group said, "I have two and my husband has three." The Maasai woman looked surprised and asked how it was that they didn't have the same number of children. When our tour member said that her first marriage ended in divorce, the wives frowned and shook their heads. We learned that divorce is almost unheard of. Women who are widowed do not remarry, but that they are welcome and encouraged to have more children. Our visit ended with an opportunity to purchase some of the crafts made by the women of the boma. I was very grateful for this unique opportunity to learn about and experience a taste of a very different culture...and to understand why some of their customs that would not be "acceptable" in our culture make sense and work well in their world. Travel opens our eyes - and our hearts. Tarangire means "River of the Warthog," but that odd little creature is just one of the many animals found along the rivers and in the thick woods and grasslands of Tarangire National Park. Less well known than Kenya's Masai Mara or its sister park in Tanzania, the great Serengeti, Tarangire - the sixth largest of Tanzania's national parks - is described on The Official Site of the Tanzania National Parks as having the greatest concentration of wildlife outside of the Serengeti ecosystem, including an abundance of elephants. That sounded good to Rob and me! After our day of tasting city life in Arusha, we were eager to get back into the bush and see what new wonders Africa had for us. Our tour group boarded our three Land Cruisers right after breakfast and we departed for our three hour drive past Lake Manyara to the gates of Tarangire National Park. We were in Masai territory, and all along the route, we passed many small groups of Masai men and children herding cattle and sheep through the dry grasslands to better pastures. Their bomas, the small family dwellings built in circles behind walls of thorny acacia, were scattered here and there, and women and children walked along the road carrying goods or waiting for the local buses to take them to the market towns. Masai youth bring their herd to a watering hole. We arrived at the main gate of Tarangire around noon, and Cosmas, our guide, provided us with a picnic lunch while he, Richie, and Ansi joined a large crowd of other tour guides and completed the lengthy paperwork needed before entering the park. The animal sightings started immediately at lunch with visits from the gorgeous superb starlings and the striking white-headed buffalo weavers, as well as some monkeys that knew that picnickers mean food! Superb starlings were brilliant - and found everywhere in large numbers. Finally it was time to go on safari! We entered a landscape much different from Masai Mara. Instead of broad open plains, the landscape was thick with trees and tall grass. Tarangire National Park is famous for its many huge baobab trees. Cosmas told us the legend of these trees. God was enthusiastic about his newest creation and threw it down to earth so eagerly that it landed upside down with its roots in the air. As we were there in the dry season, the legend seemed even more plausible, as the leaves that cover the tops of the trees during the wet season had fallen and the huge canopies of bare branches showed clearly against the sky. Because of the thick foliage here, the animals sightings were not as frequent as they had been in Masai Mara, and the numbers of animals in the herds were not as huge, but it was almost more exciting to suddenly spot a small herd of impalas or zebras hiding in the grass, or to turn a corner in the road and see a giraffe looking curiously at our little group. That long tongue is great for pulling leaves off of the thorny acacia! Part of the explanation for the number of animals in this small park is the Tarangire River, the only source of water in the area. Elephants abound here and we saw many of them on our safari. We spotted some of the smaller residents of Tarangire as well. I was fascinated by the huge termite mounds that dot the park, tall spires of dirt that create perfect "apartment buildings" for some of the burrowing animals like the dwarf mongoose, as well as lizards and snakes. Another of the most memorable and delightful aspects of Tarangire were the birds! This is home to some 550 bird species, "the most breeding species in one habitat anywhere in the world," according to the official site of the Tanzania National Parks. We didn't see anywhere near 550 of them, but the ones we saw were spectacular! My camera got quite a workout, as it did on every day of this trip, trying to capture every animal, every bird, and every gorgeous landscape. Red and yellow barbet..isn't he gorgeous?! We had had a long busy day, so in spite of our love of the wildlife, we were ready to leave the park in the early evening and settle in at the Lake Burunge Tented Lodge, a lovely lodge with a large deck and pool overlooking Lake Burunge and a line of large, comfortable tents on permanent platforms. Rob and I were very happy with our room and the large deck overlooking the woods and lake beyond. Rob is happy with our room. We organized our bags, cleaned up, and returned to the lodge for a buffet dinner where we met one more local animal, a large and gaudy praying mantis who objected to all of the unwanted attention and went into ninja attack mode! Our tent was at the far end of the row, so we were actually escorted back by a staff member who shone a light into the thick brush all around us, keeping a watch for the eyes of any predators who might be looking for an easy meal of unwary tourist. The twitters and tweets of hundreds of birds in the woods outside of our tent woke us bright and early for the morning safari drive. We entered the Sangawei Gate of the park which brought us closer to the river. The drive started as a repeat of yesterday's drive, with sights of impalas, zebras, and giraffes, but there were some special treats in store! Those odd fingers on the horn of this skull are the chrysalises of an African butterfly. We drove down the washboard roads, enjoying our "African massage," and crossed the riverbed where we watched the elephants that come to the river to drink and saw some of the many birds that live along its banks. As we left the river, our sharp-eyed driver, Ansi, suddenly stopped and pointed at a tree far across the field. There, at last, we saw our first leopard! How he ever spotted it lying low on the branch I will never know, but we were grateful for his guide super-powers - and for our binoculars! We stood in our vehicle for a long time snapping photos and just gazing in wonder at the gorgeous creature. Can you see her? I can't believe Ansi spotted her! There she is! Gorgeous! Our first leopard sighting - what a thrill. We finally had to move on and dropped another river crossing over a small bridge. Here were more exciting encounters including a couple of huge monitor lizards lounging on the cliffs over the river, more beautiful birds, and a family of mongooses playing in the sand on the far side of the river. The hamerkop looks like a cartoon bird to me. I had been noticing road signs pointing to the "Poachers Tree," and that tree turned out to be the site of our snack break. Some of the giant baobab trees are so old and so big that they have great holes in their trunks. In the past, poachers had taken advantage of the deep hole in this tree to hide from the park rangers. They could actually climb up into the interior of the tree trunk to stay hidden from the rangers until the park staff finally caught on to their game. We enjoyed the chance to stretch our legs and explore the tree before moving on. Poachers used to climb right up into the tree trunk to stay out of sight. On the way back to the gate, we had another treat - our first sight of the fascinating secretary bird, with his prominent quill feathers bristling out of the back of his head. The large bird walked daintily past us, completely unconcerned about our presence. We returned to Burunge Tent Camp for lunch, a nice nap, and a bit more bird-watching of the birds in the trees around our tent. I saw this bird in the woods below the lodge, but can't identify it. If anyone can help, let me know! The afternoon activity was an optional nature walk through the woods and down to Lake Burunge where we encountered a huge flock of pink flamingos wading in the shallow waters on the edge of the lake. They waddled this way and that, and every once in a while, for no apparent reason, a large number of them would take off in a beautiful whirl and then settle down again in a different area of the lake. ...and flying to new grazing areas. The blacksmith lapwing has a metallic call that sounds like a blacksmith pounding on an anvil. Our walk to the lake was made even more delightful by the appearance of a small herd of zebras that came out of the brush to graze along the shore. They kept their distance, but did not seem to mind our presence on the beach. I spent so much of this trip enraptured by the animals, the surroundings, and the sounds of the birds. These were sights I had thought for many years I would only see in nature films on television...but here we were, standing on a lakeside with absolutely no barriers between us and a herd of zebras! Magical! That evening, we stood on the deck of the main lodge building watching the many doves and other birds in the trees enjoying a bath in the cement watering holes provided by the lodge for the birds and other animals. As the sun set, the zebras came out of the woods again to drink from the troughs. Tarangire National Park was a delight from the first moment to the last! Stay tuned! Coming up - a visit to a Masai village and rustic tent camping in the Serengeti!